When I was very, very young the first movie I have any real memory of seeing is The (generally forgotten and unnecessarily sequel-ed) Land Before Time. It inspired my love of dinosaurs. Five years after that experience Jurassic Park cemented that love. My inherent love of science bred a fascination with robotics and A.I., and despite being late to the franchise, Mass Effect seeded a love for them that some people don’t trust (I promise I’m human guys!). So when Horizon Zero Dawn’s trailer in 2015 I was, naturally, in awe. This game is the love-child of my passions. But does this perfect mix of subjects translate into a game worth playing? 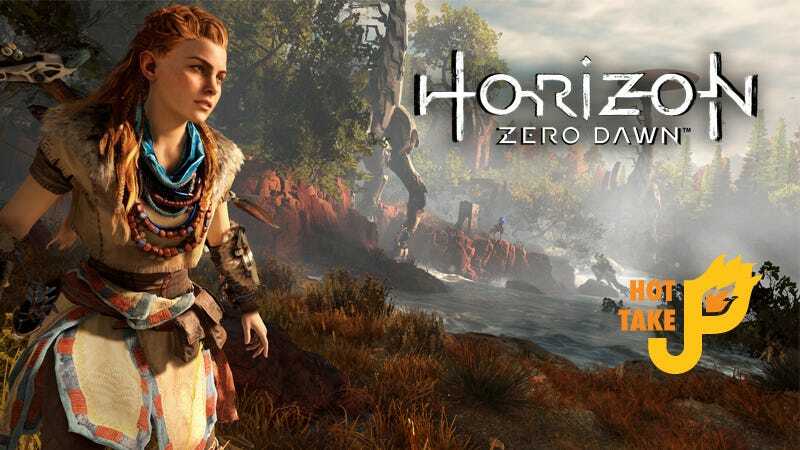 Be prepared, Horizon Zero Dawn feels like it borrows and revises a lot from other games in somewhat similar genres so I’ll be making a lot of comparisons. Thanks to a release date very near The Legend of Zelda: Breath of the Wild, its hard to not compare the two. In more than a few ways we’re experiencing different approaches to a very similar kind of game, but where one falters, the other shows strength. Aloy has a lot of the same moves as Link, but combat feels more refined and responsive in Horizon: Zero Dawn. The combat feels much more varied than in BotW, and having a skill tree made character growth feel great. Multiple kinds of projectile weapons along with varied stealth and melee options gave a little more depth to enemy interactions. Aside from a few landmarks (which are more meaningful to those who’ve lived in/around Colorado. I recognized the U.S. Air Force Academy immediately), the open world isn’t very exciting. That’s cobbled even more by the fact that you can’t climb anything and go anywhere. Mounts can navigate trails and slopes better than horses in Breath of the Wild though! The Focus’s use to highlight enemies, weak points, and other useful information is a good evolution on the Metroid Prime scan visor model. The Focus’s scan ability scratched an itch that the Metroid Prime series left me with. Mass Effect’s attempt was a bit sad, but Horizon Zero Dawn does a great job combining a decent amount of information with some snazzy visual flair. Bioware’s Mass Effect Andromeda was supposed to be the poster-child for beautiful games on the PS4 Pro, but Horizon Zero Dawn is legitimately one of the most beautiful games I’ve played. The game goes for a more photorealism so, outside of the robots, it’s artistically unremarkable, but the technical skill in the models, lighting, and visual effects are perfection. Even when you’re a bit overpowered, fighting a Thunderjaw is daunting. The robots are creative and awe inspiring. The way that many of these creatures fight and interact are so natural that it’s almost how I’d expect them to act in real life. All of the dinosaur/animal/robot hybrids are amazing but the bigger beasts are especially a wonder to behold. Thunderjaws and Stormbirds, though intimidating, are beautiful in their construction. Theory 1: Everyone is in a bunker and Aloy was left outside the bunker as some sort of link or key between the worlds outside and inside. At first the story is unimpressive, but the twist near the end blew my mind. Up to that point I’d been revising my theory of events with the little bits of info picked up with my focus. Ark ship, cryo-statis, and underground bunkers were all prominent ideas I had at different points up till the reveal. What struck me the most was how the reveal of actual events compared to my theories shook me (in a good way). Horizon Zero Dawn is like Guerilla Games wrote a curriculum vitae of video games and distilled it into near perfect execution. It’s refinement of mechanics that have been around is a mark of mastery rather than rehashing. It has it’s minor flaws, but definitely a Game of the Year contender. If you own a PS4 you should own this game.